Outside of Ricky Rubio and Kyrie Irving, this year’s draft class could be remembered for how many quality big men it introduced to the NBA. More than half of the players ranked this week are centers or power forwards. So why are the big boys suddenly surging? Rookie big men have longer NBA learning curves. They must adjust to the speed of the pro game, the sophistication of its coaching schemes, and the grinding physicality of playing down low. More often, guards can just go out and play. Thirty games into the season, the bigs are starting to figure things out. And with top rookie Kyrie Irving missing games last week with a concussion, we have a new no. 1, at least until Irving returns. Rubio is struggling with his shot right now, but his scoring hasn’t suffered too much because he finishes well at the rim. Rubio shoots 53 percent around the basket in non-post-up situations, according to Synergy Sports. He’s able to convert these shots because he uses his body to create space and protect the ball when he goes to the basket. Let’s look at three shot attempts from the past week. In the first image, Rubio drives baseline for a layup. Instead of going up with his shoulders perpendicular to the backboard, Rubio squares up, gets his shoulders even with the backboard, and drops it in. This means that if a defender wants to block Rubio’s shot, he’s going to have to go through Rubio’s body and commit a foul. In the second image, Rubio drives the lane as Tyson Chandler rotates over to block the shot. Rubio, however, jumps slightly into Chandler’s body, which grounds the shot blocker’s momentum and forces Chandler to jump to avoid the foul instead of jumping at Rubio and the ball. Finally, in the third image, Rubio drives baseline and shoots a reverse layup, putting the rim between himself and his defender and creating enough space to release the shot. With Kyrie Irving and MarShon Brooks, two of this season’s top three rookies, sidelined with injuries, Thompson has leapt up the rankings. We’ve already examined Thompson’s spot-up shooting, where his 1.434 points per possession put him in the top 2 percent of NBA players. Thompson, however, doesn’t just stand on the perimeter and wait to shoot. He’s performing well as a mid-aughts Rip Hamilton-like scorer, using screens and moving without the ball to create shots. 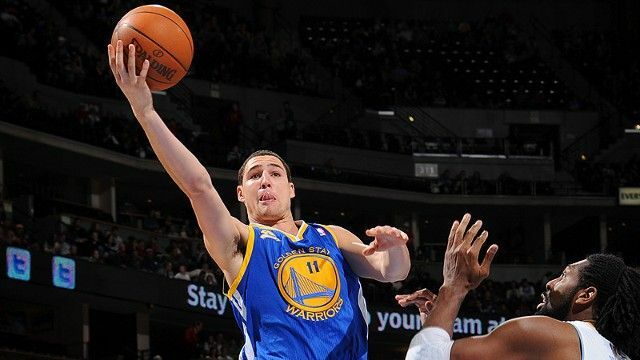 Thompson is shooting 52.1 percent on shots that come after he uses a screen. Thompson rarely comes directly off screens. He almost always sets them up with a slight hesitation or a step in the opposite direction. He changes speeds to lull defenders to sleep or get them going in the wrong direction. He sets up screens so well that the Warriors can run the same play multiple times against the same opponent and have it result in open jumpers again and again. Leonard has played most of his minutes at small forward and a few at power forward. His offensive rebound rate of 8.4 is well above the league average of 5.3, according to Hoopdata.com. On the defensive end, the 6-foot-7 Leonard’s size allows him to be a very effective post defender. When players try to post up against Leonard, he holds them to 15.8 percent shooting and allows them to score only 0.458 points per possession. That places Leonard in the 98th percentile of NBA individual post defenders. When small forwards try to post up Leonard, he does a good job of edging them out of the paint before they catch the ball. Once he’s got them there, he’s usually too big for them to back down. The result is often Leonard forcing players to shoot quick turnaround jumpers, and outside of Kobe Bryant and Michael Jordan, not too many players have looked good taking those shots. Last week, we looked at Kanter’s ability to cut and move without the basketball. This week, let’s focus on one of his weaknesses: scoring in the post. Kanter puts up 0.627 points per possession when he posts up; that places him in the bottom 17 percent of all NBA players. He shoots just 34.2 percent and commits turnovers 17.6 percent of the time when he gets the ball on the block. Two things stand out about Kanter’s post game. First, he gets fantastic deep position. Second, he doesn’t know what to do with that position once he gets the ball. Kanter has no finesse and no go-to move in the post. He just tries to power his way to the rim. That doesn’t work against defenders as big and strong as NBA big men, and it leads to turnovers. Kanter either travels, gets called for offensive fouls, or gets the chair pulled on him. Right now defenses are wisely exploiting Kanter’s weakness by staying in front of him and just waiting for him to make mistakes. Shumpert has been all over the place in these rankings. He’s been in the top three, at the bottom of the list, off the list, and now he’s back in the top five. His recent surge is largely thanks to Jeremy Lin’s impact on the New York Knicks. Now that Shumpert is playing with a true point guard, the rookie’s performance is improving. 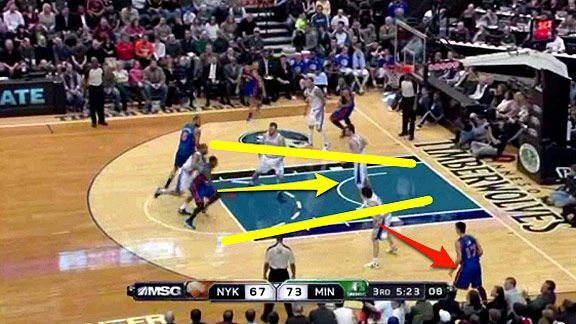 But it’s not really because Lin is getting the ball to Shumpert in positions to score. Instead, teams have been focusing so much on Lin and denying him the basketball that defenses are becoming stretched out, opening driving lanes for Shumpert. 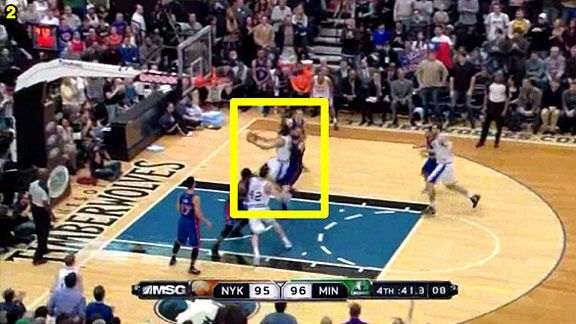 In these images, look where Lin and his defender are on the court. Ricky Rubio, guarding Lin, is in the passing lane, trying to prevent a pass to Lin. That leaves him out of position to help on dribble penetration. 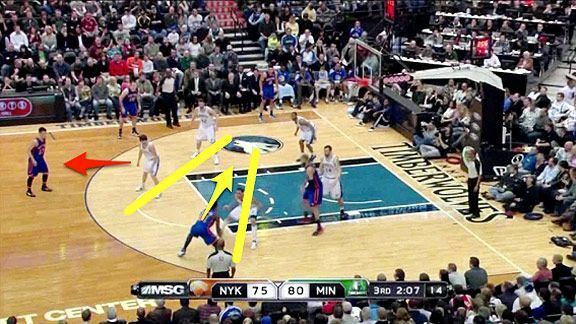 This allows Shumpert to use his first step and beat his man to the basket. Shumpert went from playing out of position at point guard, to playing shooting guard alongside bad point guards like Mike Bibby and Toney Douglas, to playing next to Lin, who just had one of the most astounding weeks in recent NBA history. Shumpert no longer has to worry about running an offense. He just has to be aggressive and try to score when an opportunity opens up. That’s something Shumpert can do very well. Brandon Knight continues to struggle with turnovers. Young point guards are expected to turn the ball over a little too much in half-court situations, but Knight is also giving the ball away in transition. Knight scores one point per possession in transition, which puts him in the bottom third of NBA players, and it’s mostly due to turnovers. Knight commits turnovers on 22.4 percent of his transition possessions. Knight still hasn’t adjusted to the speed of NBA defenses, even on three-on-two fast-break situations. Eventually, Knight should figure things out, and when he does his statistics and his ranking will rise. The Charlotte Bobcats are a terrible team. However, they have one bright spot and one fun player to watch, and his name is Kemba Walker. That said, Walker has struggled all season long to run the pick-and-roll. First, Walker is too loose with the ball. He turns it over on 11.9 percent of his pick-and-roll possessions. 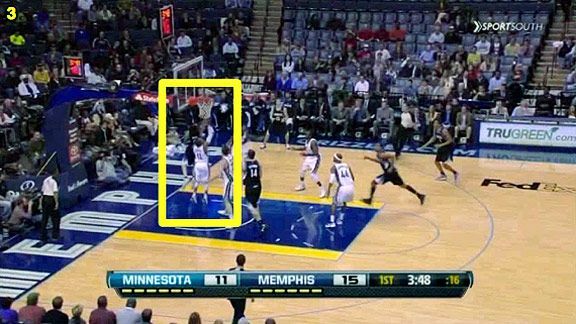 More troubling is Walker’s tendency to settle for jump shots. When he uses ball screens, Walker takes jumpers 78 percent of the time. Only three players with at least 40 pick-and-roll possessions are taking a higher percentage of jumpers. The problem is that Walker isn’t knocking down these shots. He makes 32.9 percent of them. The Bobcats really want Walker to become a pick-and-roll point guard. He runs it on 30.8 percent of his total offensive possessions, and if Walker wants to be more successful he should start attacking the rim. We’re past the “pleasant surprise” phase of Morris’ career. Now the Suns expect him to perform night in and night out. Morris’ biggest fault is his inability to score off offensive rebounds. According to Synergy Sports, he shoots 31.3 percent on putbacks. Morris’ biggest problem in putback situations is that he doesn’t keep the ball high after getting a rebound. Instead, he tends to bring it down. When he does that, it gives bigger defenders time to get in position to bother Morris’ shot. Morris is crashing the offensive boards well, but he needs to score after grabbing those rebounds. Williams should be higher on this list. He has fantastic athletic ability, he’s knocking down spot-up jumpers, he’s scoring in isolation situations, and he plays with Ricky Rubio, a point guard who makes the guys around him better. So why is Williams close to the bottom of these rankings? Because he struggles in the pick-and-roll. Williams sets the screen in pick-and-roll plays on about 14 percent of his possessions, but he shoots just 29.6 percent when he rolls to the rim and gets the ball. That number should be much, much higher. The big problem with Williams’ pick-and-roll play is that he pops out 63.9 percent of the time in these situations. As I mentioned before, he plays alongside a gifted passer in Rubio. If Williams rolled to the rim more often after setting screens, Rubio would find him for easy baskets, and Williams’ numbers would improve. After being on the fringe of these rankings for a long time, Parsons has finally cracked the top 10. He earned his spot thanks to his work on the offensive glass, where he posts a 6.4 offensive rebound rate, according to Hoopdata.com. And, unlike Morris, Parsons converts his offensive boards into points at a high rate. According to Synergy Sports, Parsons scores 1.269 points per possession on putbacks, placing him among the top 20 percent of all NBA players. This ability to turn missed shots into points is a big reason why Parsons is on the court for the Houston Rockets.